J.C. Penney scored a bit of fresh thinking poaching Ron Johnson, the man responsible for Apple's glitzy stores, and Cupertino's successful retail strategy in general, which rakes in $3.2 billion of sales revenue. The 109-year old department store chain could certainly benefit from Ron's disciplined approach to retail, whose directions range form where to place each item in the store, to the way you share information about Apple's gadgets, even outside work. Apple's chain of 323 stores worldwide has definitely helped to make it one of the most valuable brands, bringing visibility and differentiation to the company. 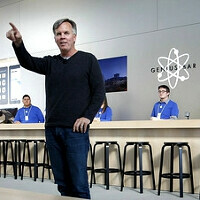 Ron Johnson leaving at a moment when Apple is on top of its game could mean he is just looking for new challenges, or maybe some of his new ideas have been shot down. Either way, it will be interesting to see what J.C. Penney's stores will look like after November when he becomes the CEO. The retailer's stock price is already up more than 17% on the news. Great! Now I can expect to have to go to the customer service "bar" to return something... Or find that JC Penny's will only sell only 1 type of shirt, jeans, shoes... at least until the next GS model comes out next year. Maybe JC Penny's will now have a Magical clothes in stock!